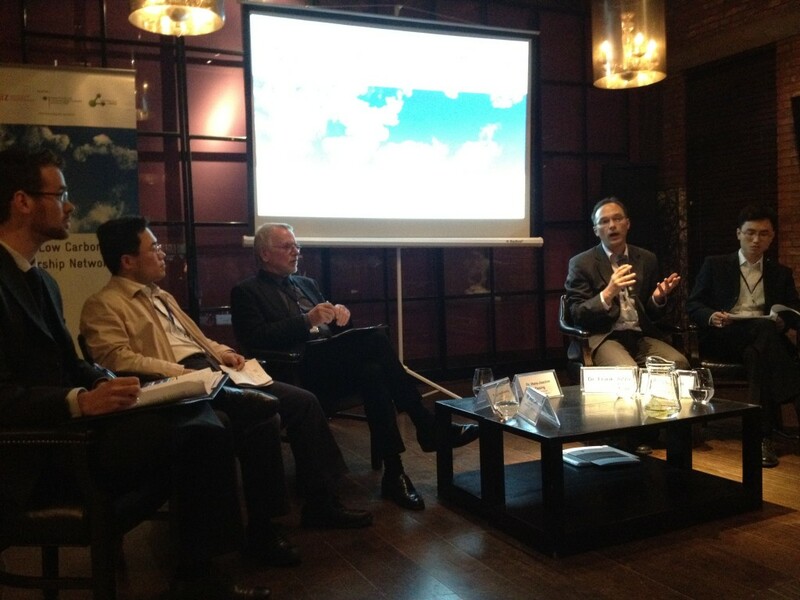 From Left: Mr. Allan Lee (China Carbon Forum) (Moderator), Prof. Duan Maosheng (Tsinghua University), Dr. Hans-Joachim Ziesing (Ecologic Institute), Dr. Frank Jotzo (Australian National University), Mr. Wang Wenqiang (SinoCarbon). “Linking Emissions Trading Schemes: Thoughts on China’s Pilots” was the ninth in the China Low Carbon Leadership Network 2011-2012 event series jointly organized by the Deutsche Gesellschaft für Internationale Zusammenarbeit (GIZ) and China Carbon Forum (CCF). 72 representatives of government, NGOs, business and media joined GIZ and CCF to discuss linking ETSs in China. Participants considered that linking emissions trading schemes brings efficiencies worth encouraging in the long term, but requires technical compatibility as well as political circumstances that are rare in reality. Whereas Europe’s first phase was a full-scale trial with a single set of rules for all member states, China’s pilot schemes are consciously trialing different rules at a local level ahead of a national scheme. Their short term priority – and challenge – is therefore not to link but simply to each become operational. In fact, linking among China’s pilots could limit their ability to experiment with different rules and mean flaws in one pilot undermine another. An eventual national scheme in China is thus more likely to supercede rather than emerge from linked local pilots. Linking often involves assymetries where the larger market has more power. In the future, if a Chinese scheme were to link internationally, Beijing could in effect become the ‘rule maker’ of the world’s carbon markets. The following is an edited synthesis of the discussion. As per convention, individual’s comments are not attributed. China’s pilots need to consider the consequences and implications of linking. At this stage there is an obvious lack of data on both mitigation potential and mitigation cost. The determination of responsibility between national bodies and provinces, particularly in relation to credit exchanges, remains unclear. National bodies assess GHG emission intensity targets, but the exchanges are accountable only at the provincial level. When central government assesses intensity performance, how would they assess the transfer of credits across linked schemes? 3-5 years was suggested as the period before linking could be considered, but the MRV would need to be clarified between all linking participants. It was also noted that linking schemes domestically could provide invaluable experience for eventually linking a national scheme with others. Conversely, some felt that it would be impossible to link China’s pilots in the foreseeable future. Reasons included local protectionism regarding the credibility of purchases from others provinces, especially in the absence of a futures market for carbon, and companies would therefore remain risk averse. Consequently, the solution might come from national level ETS development, rather than linking. It is difficult to understand what the demand for credits will be because the cost of non-compliance is unknown. Further, the amount to which China’s government can fine enterprises is limited. China’s pilots focus on industrialized cities and mainly on the building sector, which has not the experience in other countries. It was suggested that ETSs are more suitable for large upstream emitters who can readily pass on the costs to end users. The EU is now considering simplifying its system to include only large emitters. Why couldn’t China develop a similar system for a small group of upstream emitters who could pass on a price signal, rather than leaving the burden to so many downstream users? This could cut down the administrative burden, while increasing the effectiveness of the carbon prices. In response it was suggested that due to the selection of the pilot regions, which often import and export power in and out of each region, it would be easier to focus on the residential building sector – China’s biggest energy consuming sector. Linking ETSs takes time. The ETS must be fully operating before considering linkages. It takes time to establish a sufficient database. Having the right database took a long time in Europe. Reliable data was considered paramount – without reliable data, the ETS can’t start effectively, and linking could not be appropriately considered. Linking would reduce the opportunity for experimentation, but would ensure the most efficient use of resources, in terms of purchasing credits from activities across all linked schemes with the lowest cost of marginal abatement. Each ETS linking proponent must trust the MRV of the counterpart system. The stringency of the caps within each scheme must represent mutually acceptable levels of ambition, and the overall cap should not be inflated. The experience from the EU suggested that a central scheme governed by one body would be more effective. The earlier bargaining and allocating process between different member states was not as rewarding as was hoped, therefore EU moved to an EU wide cap – from a differentiated scheme to a central scheme – regulated by one body. If the schemes weren’t fully integrated, it would be difficult for large companies with different sub-companies in different regions to manage. The experience from Australia was that bigger companies are happy to see integrated markets because it makes it easier for them to comply, and that companies prefer a clear signal going forward. Learning by doing was suggested as a good way to learn, and not to be too shy to experiment.